The United States Mint first produced the Standing Liberty quarter in December of 1916 and production continued until 1930. 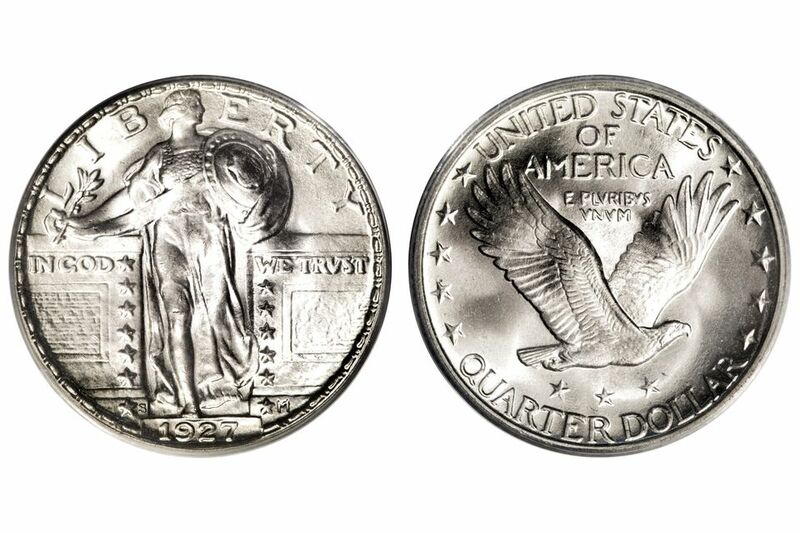 Quarters were not minted in 1931 and production resumed with the Washington quarter 1932. In December of 1915, The Treasury Department announced that they would hold a design competition to replace the existing designs of the dime, quarter and half dollar. In March of 1916, Hermon Atkins MacNeil's designs for both the obverse and the reverse were chosen to replace Charles E. Barber's stoic designs on the quarter. MacNeil's models for the new quarter had Lady Liberty standing between two piers inscribed with "In God We Trust", thirteen stars (seven on the left pier and six on the right) and his initial "M" in the lower right. MacNeil's original design had two dolphins that skirted Lady Liberty's feet but were removed before the coin went into production. Lady Liberty is holding a shield in one arm to symbolize protection and an olive branch in the other hand symbolizing peace. The first variety of this coin has drapery across Liberty's body exposing her right breast and is known as "Type 1." Approximately halfway through 1917 the design was changed so that her upper body was covered with a coat of chain mail. This is commonly known as "Type 2." The original reverse has an eagle in flight with seven stars on the left side and six stars on the right side. The mint redesigned the obverse in 1917 to move the eagle higher on the coin and place three stars beneath it. In 1925 the date was recessed into the base that Lady Liberty is standing on to protect it from wearing away prematurely. Some collectors view this as a "minor design change" and do not assign it a separate type. Other collectors consider this a separate design and have termed it "Type 3." Coinage of this new design began on December 16, 1916. From that date until the end of the year, the United States Mint produced 52,000 quarters with the 1916 date. These 1916 dated coins were held and released with additional coins that were dated 1917 beginning in January of 1917. The coin collecting community eventually realized that a rarity was in their midst. Because of the fine detail and high relief of the coin, well-struck coins command a premium. One of the hardest features to strike up clearly is Lady Liberty's head. Uncirculated examples that show the full details of Lady Liberty's head will have a "Full Head" designation with the grade (abbreviated "FH"). The rivets on the left side of the shield are another place to confirm that the coin was sharply struck. The beginning collector on a limited budget that is seeking a single example of a Standing Liberty quarter for their type collection can acquire a problem-free circulated example for around $10. The intermediate collector seeking an uncirculated example should be able to find one for approximately $175 dated between 1928 and 1930. If you have a slightly expanded budget, you should strive to collect an example of each of the three types of Standing Liberty quarters. An uncirculated type set that includes all three types will require additional expertise and more financial resources. For the Type 1 coin, you should obtain a 1917 Philadelphia minted specimen. For the Type 2 coin, your best value will be found in the 1923 or 1924 Philadelphia minted coins. Any of the Philadelphia minted coins for the Type 3 (1925-1930) will provide good value. Given the rarity and expense of the 1916 dated Standing Liberty quarter, this can be a "showstopper" for the beginning and intermediate collector. A complete date set running from 1916 through 1930 will consist of a total of 15 coins. You will need both examples of Type 1 and Type 2 1917 dated quarter. A circulated set will cost about $5,500 to assemble, while an uncirculated set will cost over $20,000 to complete. A complete date and mint set of circulated coins can be assembled with some time and patience by an intermediate collector for not much more than a date set. Once again, a majority of your budget will be allocated to purchasing the key date 1916 Standing Liberty quarter. The complete set will consist of a total of 37 coins which include three Type 1 coins from 1917 and three Type 2 coins from 1917. The advanced collectors with a sizable budget will strive to assemble an uncirculated date and mint set. You should budget approximately $6,500 for a circulated date and mint set and at least $35,000 for an uncirculated set. The most advanced collectors with large collecting budgets will attempt to assemble a complete set of Standing Liberty quarters that include every date and mint combinations along with the 1918/17 doubled die variety. Additionally, they will take the time and patience to look for the best struck uncirculated specimens that have the "full head" designation. There are approximately five 1916 and ten 1917 proof coins known to exist. Some experts contend that these are "special strikes" and are not proof coins. A set of this magnitude will easily run into the hundreds of thousands of dollars. Many factors go into determining the price and value of a coin. As a coin collector, you must develop your coin grading skills in order to determine an accurate value of your coins. Also, you will directly benefit from learning as much information as you can about the Standing Liberty quarter coins. This includes such information as mintages, die varieties and detailed specifications. The following guides will help you learn these skills.